Lemony Snicket is the pen name for American novelist Daniel Handler and is best know for his series of darkly comic children's books known as A Series of Unfortunate Events. The 13 novels in the series relate the hard-luck history of the Baudelaire orphans, Violet, Klaus and Sunny. 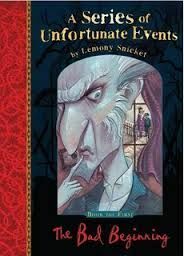 Snicket narrates their piteous adventures and misfortunes at the hands of evil Count Olaf, a master of disguises and truly bad actor.